In When Inspiration is Failing Along Comes Wargames, Soldiers & Strategy 97 I mentioned that I was developing an interest in the Anarchy – Stephen and Mathilda’s brawl with each other over the English crown in the period 1135 to 1153. I spoke of Normans. 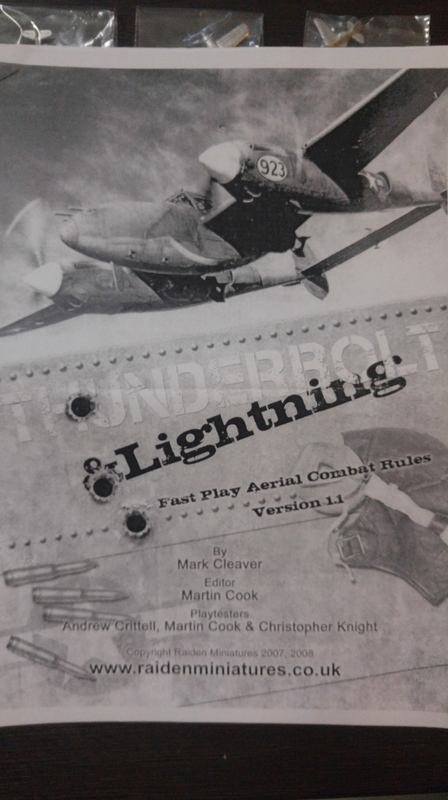 I also mentioned that it was leading me to consider another wargames project so last night I did some more reading and research. The Anarchy was some 70 years after William’s invasion of England so in fact, we are not talking about Normans as such but rather the Anglo-Norman successors of William’s invasion. The English barons supported Stephen so we are dealing with the Anglo-Normans. Mathilda’s supporters included Robert of Gloucester and the Battle of Lincoln in 1141 pitted Robert against Stephen so Anglo-Norman vs Anglo-Norman army. Later Henry, Mathilda’s son, invaded with some knights so I can find an excuse to add a Feudal French force. The Normans also invaded Sicily so add a Sicilian opponent. Other enemies over the period involved include the pre-Feudal Scots and Scots Common, the Welsh, and lastly the Anglo-Norse. 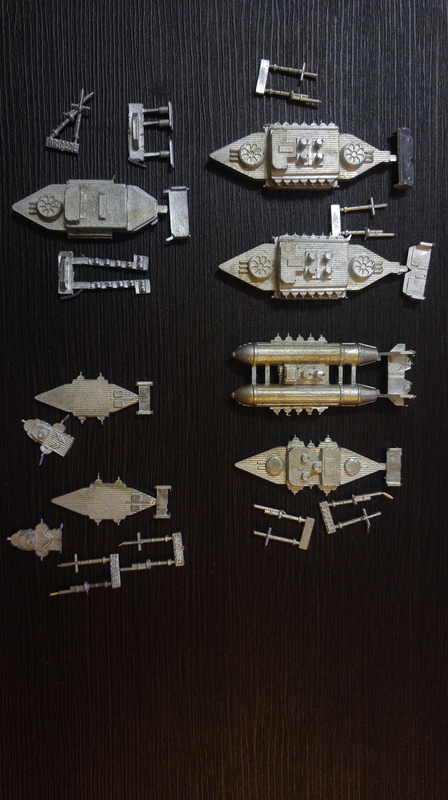 A fine collection of forces for a matched set. Figures were jumbled all over the place and there were a number of bent spears. I was more worried about anything that had broken off. Fortunately, nothing was broken off, just a lot of bent spears and the odd paint chip. 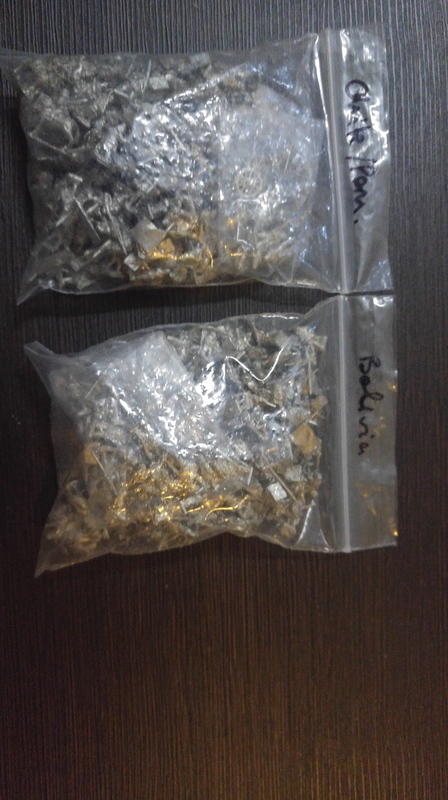 The paint chips were not seriously noticeable so I have decided to leave them as they are. 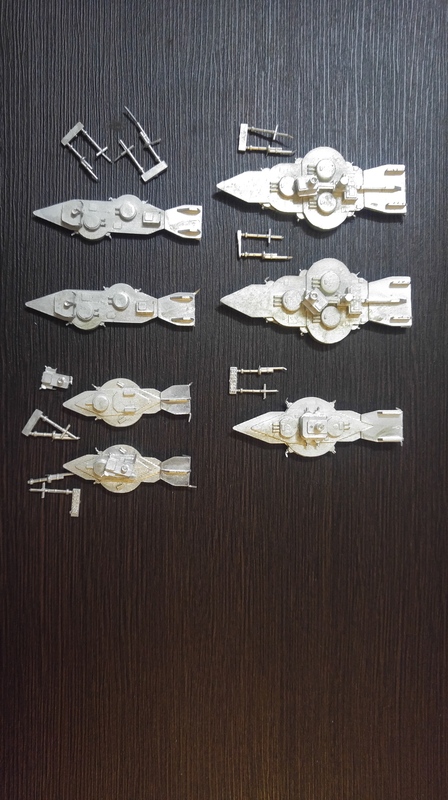 Now these three DBA armies are ready for battle again. 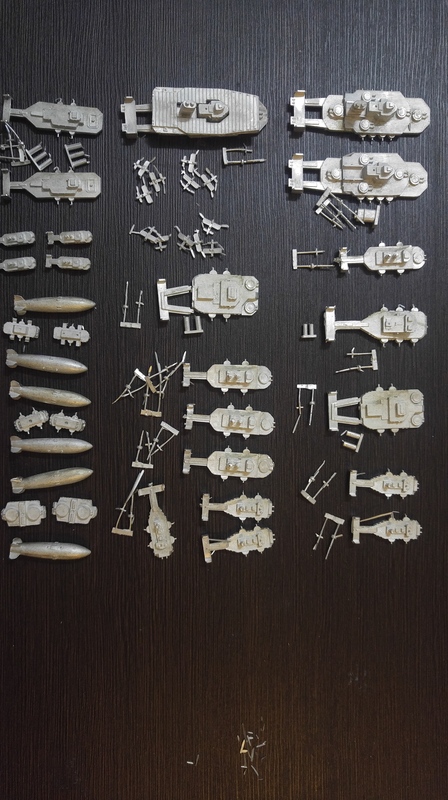 All the figures here are 15mm scale with the Later Hungarians being from Essex Miniatures, the Nubians are old series Gladiator Games and the Koreans are Alain Touller Figurines. 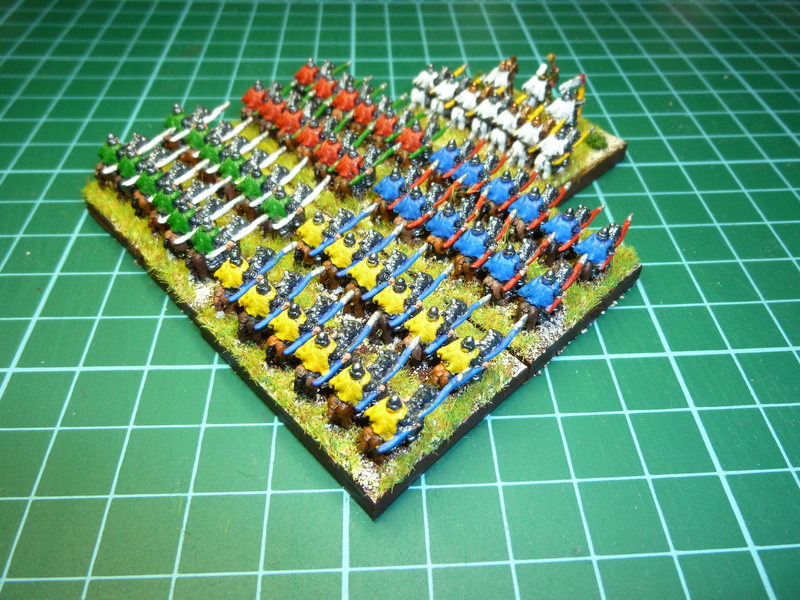 The Parthian Cataphracts assemble – or – I give you the Rabbitohs! I wanted a bright, uniform theme to the Parthian Cataphracts, especially as these generally were the bodyguards or professional troops of the various Parthian kings. I thought, a different cloak colour for each element as there will be 12 figures per element and we will have a pretty uniform look. Not sure why but I thought, colour the lances as well. This desire for brightness in the Cataphracts was further fuelled by reading Peter Darman’s The Parthian series. Sigh, I fear there is a rugby league theme developing in the painting of the Parthians – to the left I give you the South Sydney Rabbitohs! I just had a look at the other part painted figures next to the painting table and I can see the Parramatta Eels their. Possible also Easts Roosters and maybe one other. Should not paint Parthians in Rugby League season! 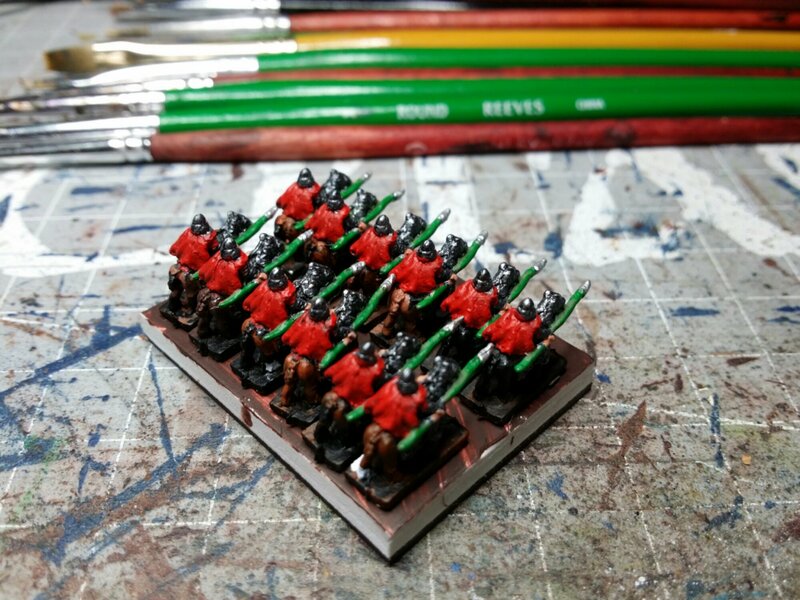 Someone did so the short painting period before bed tonight to relax and help me sleep was to prototype the 6mm Parthians. 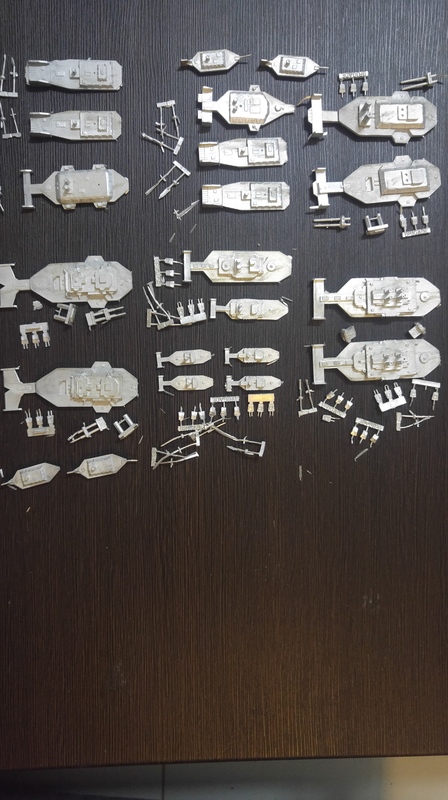 As I mentioned before I am using 15mm scale base sizes and increasing the number of 6mm figures on the base. 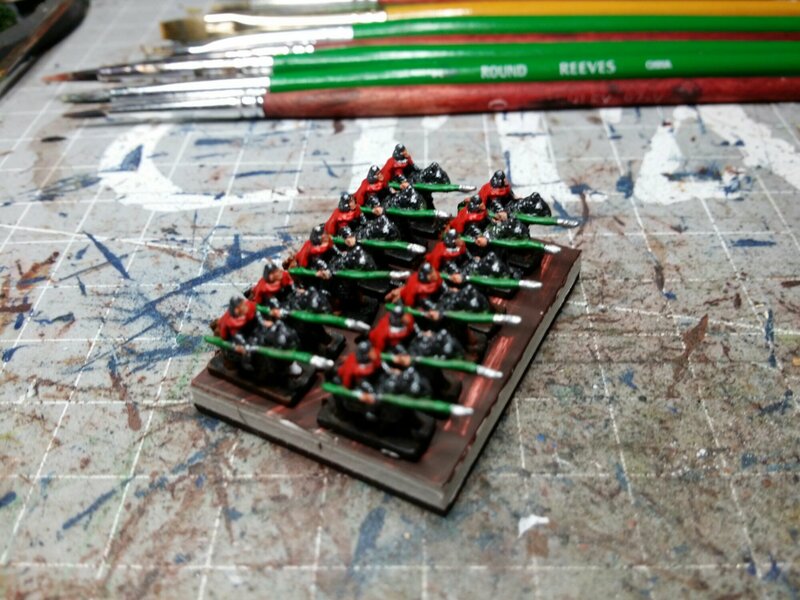 So, for example, close order infantry (blade, pike, spears etc) will have 16x6mm figures, on average, on a base. 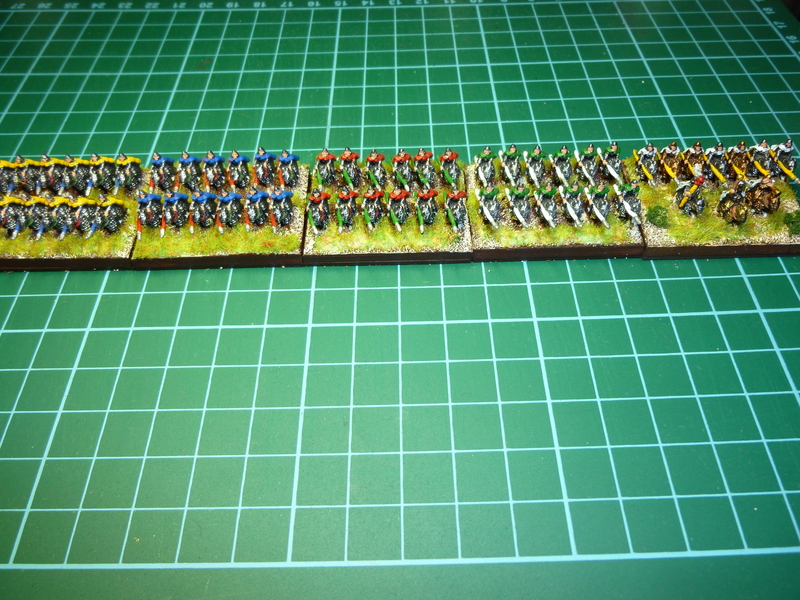 Close cavalry (knights, cavalry etc) will have 8 or 9. Light horse four. Psiloi 6 to 8 figures and so on. The Parthian cataphracts posed a question for me though as they were generally fairly linear and if I worked on there being 9 figures on a Cavalry base, the cataphracts should have 12. 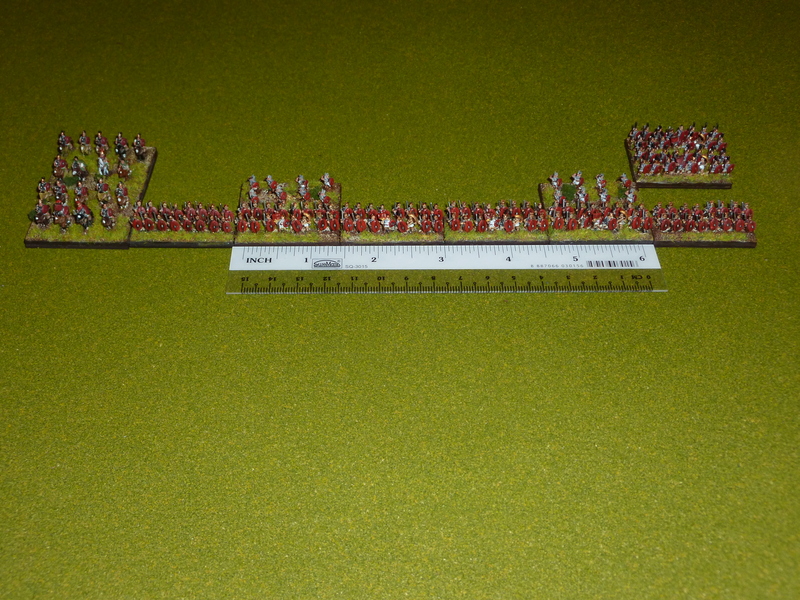 Two ranks of Cataphracts just did not look right so I think I will scale them to seven to a cavalry base, but in a boot-to-boot line across the base – as in the second rank below. Below are three shots of the general base for the army. 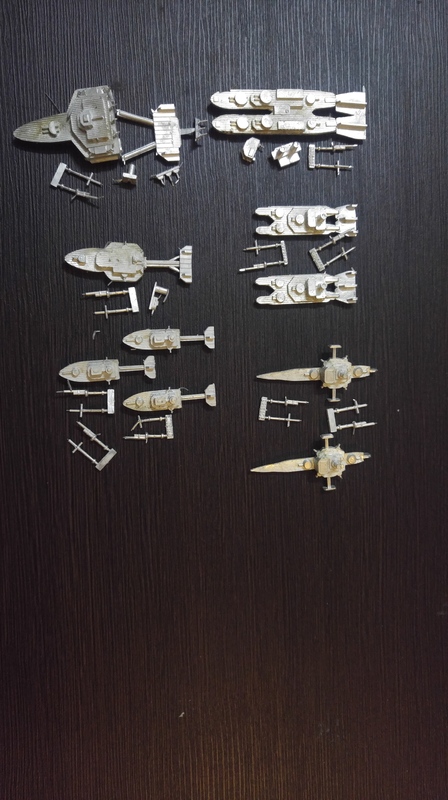 Image shows general, standard and trumpet as well as cataphracts and that is how the other bases should look, I think. 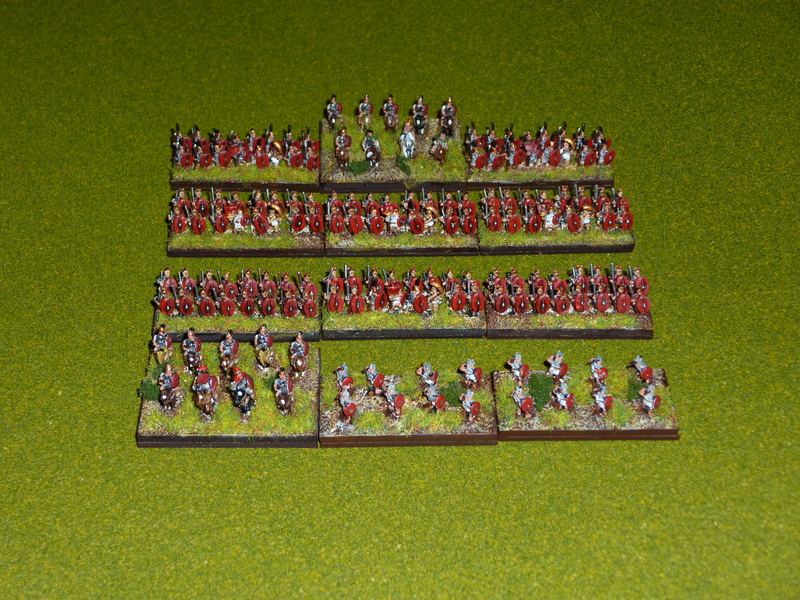 The 6mm Camillan Roman DBA Army – figures by Baccus, painting by numbers! 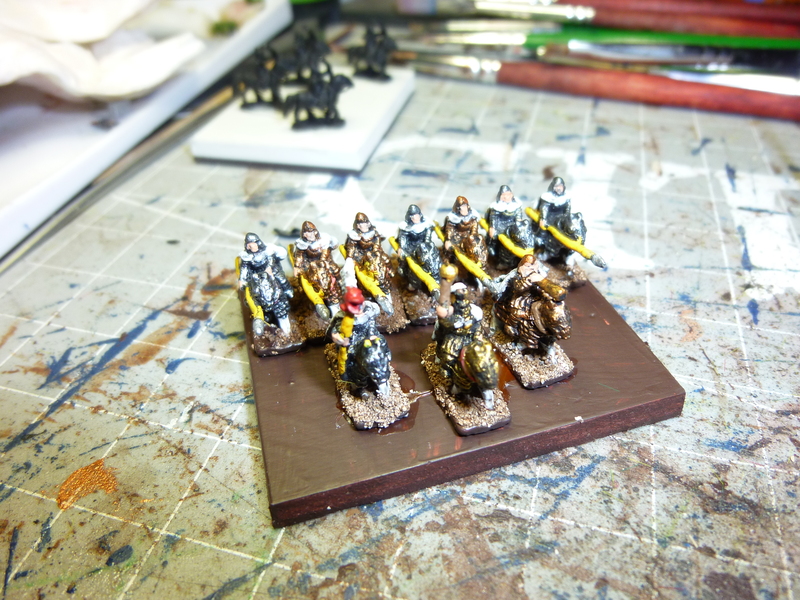 I started these chaps about two years ago or so — soon after I finished the Numidians. They have been sitting, about 25% finished, just above my painting table where I could not miss seeing them gathering dust. I decided last week that to combat a large degree of stress in my professional life I would finish these off. All that had been completed before were the velites (two bases front to the right in the picture to the left). 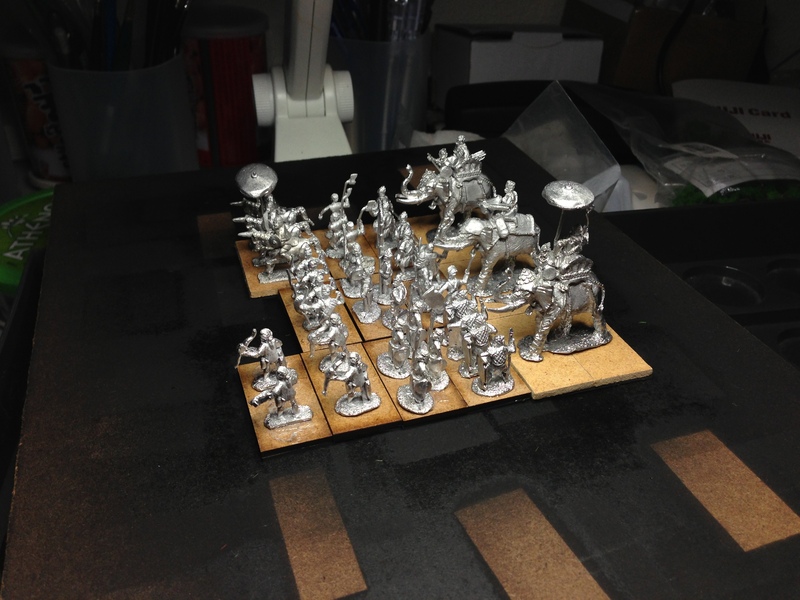 The others had been undercoated and the cavalry was half painted. Of course, it had been so long since I painted them that I could not remember the paints and flocks that I used doing the basing. 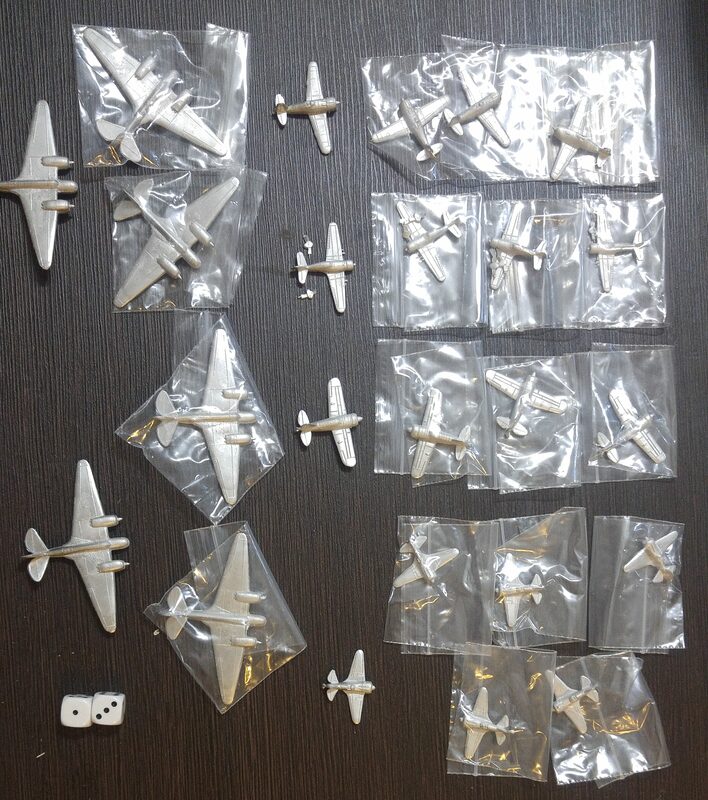 The DBA 6mm collection slowly growing. 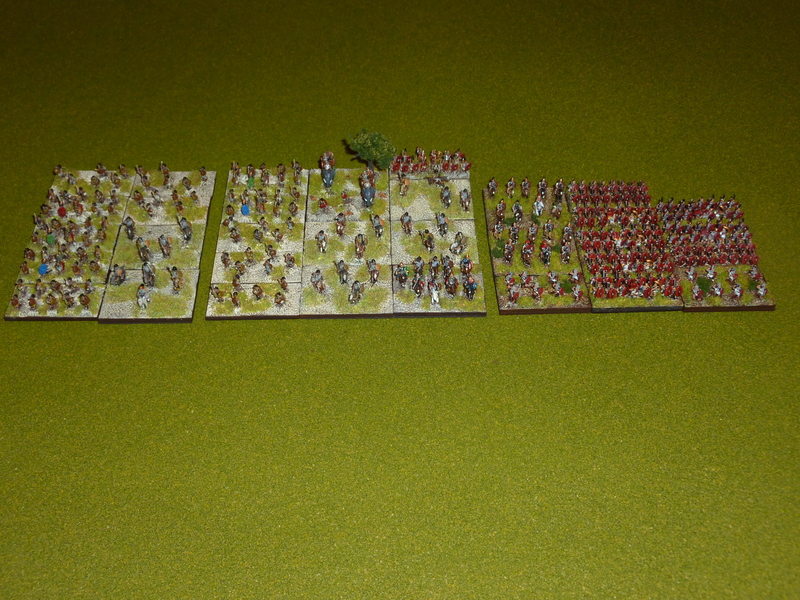 Here are the Romans arrayed next to the Numidians. 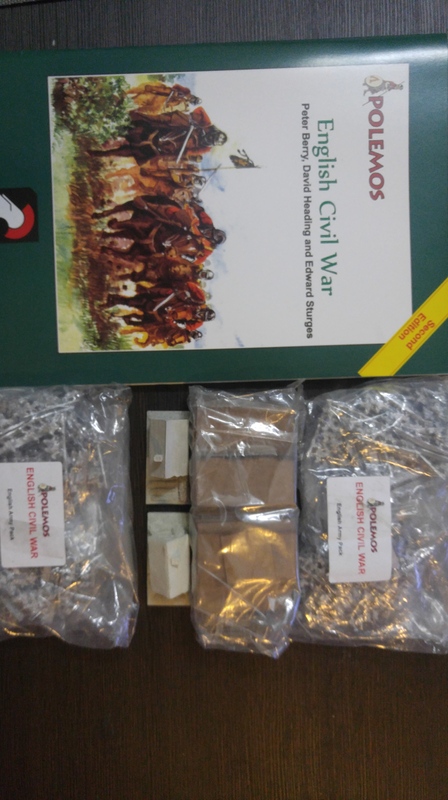 These are the first two of my seven army Singapore wargames project that I should have finished two years ago! Just for reference and because it has been so long ago, I arrayed the Numidian figures on the playing surface next to the Romans. I built the Numidians with all options so picked 12 of the most interesting (that’s the 12 around the elephant) and then put the rest of the figures in a third group. As you can see there are quite a few more Numidians than Romans. That Roman Army, however, has absolutely no choices except for the choice of a general on foot or on horseback. I just assumed that with the amount of close order foot there I would never really think about taking the general other than as the mounted option. 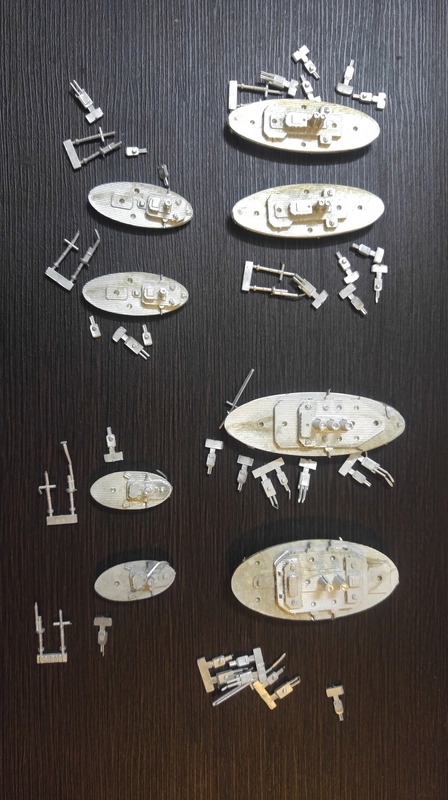 Both armies are built from Baccus Miniatures 6mm figure range — a wonderful range of ancient troops. I still have to get around to doing camps and such but that will be later in the project. I’m not sure what will be next under brush. 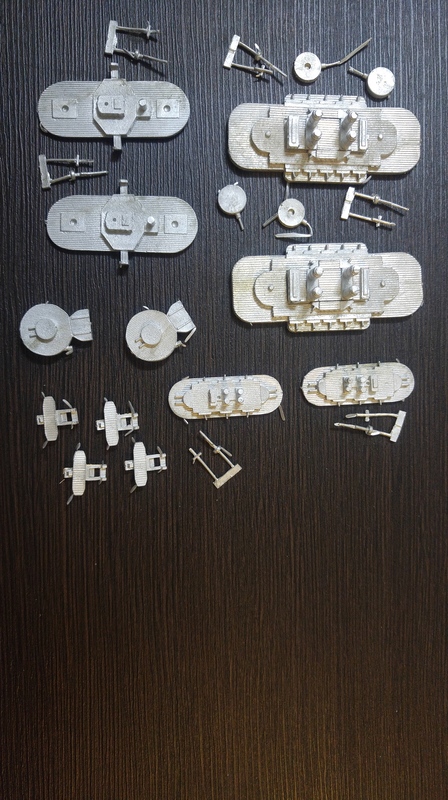 Maybe the 6mm Japanese World War 2 tanks, perhaps a DBA Parthian Army (seems appropriate as I am reading Peter Darman’s Parthian Dawn at the moment – and feeling very horse soldierly as a result) or even the next army in the Singapore Wargames Project – Gauls or Spaniards. 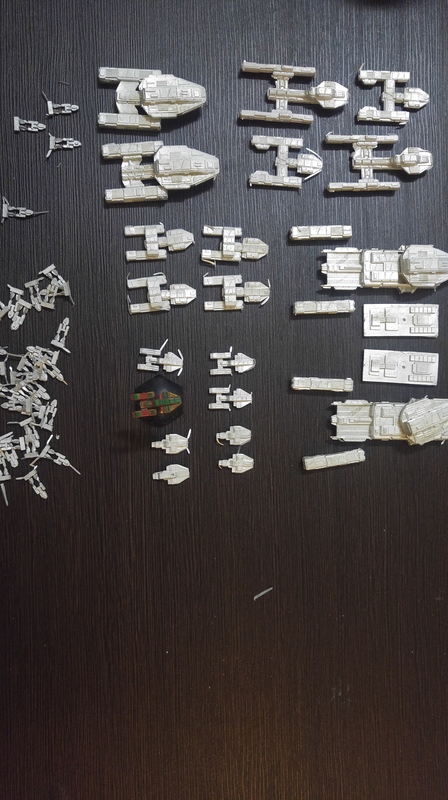 I will leave you with a parting picture – this for the non-wargamer reading this so they can get an idea of scale. 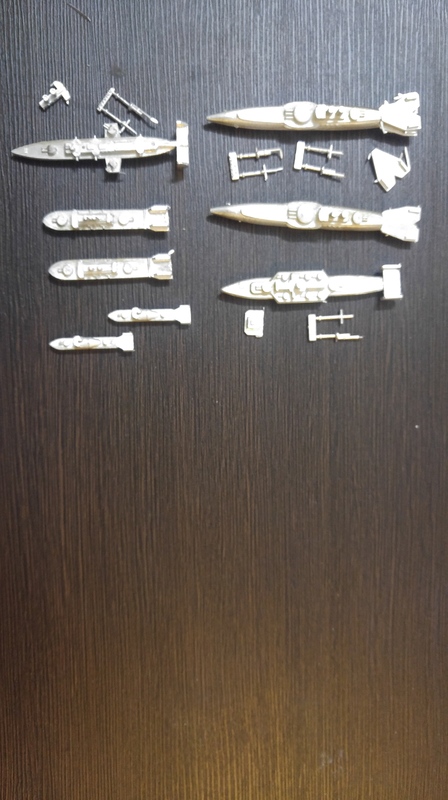 And for the non-wargamer, a sense of size of the 6mm figures … yes they are small and no I do not have a lot of patience, I am a grumpy old fart! Don’t you just hate it? 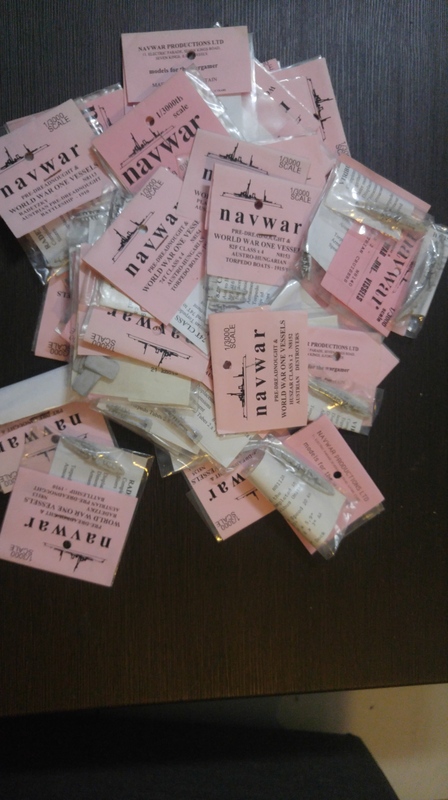 You calculate the army, you determine the number of figures, you add up the cost, add on the price for postage, add on the mark-up for PayPal and send the order. 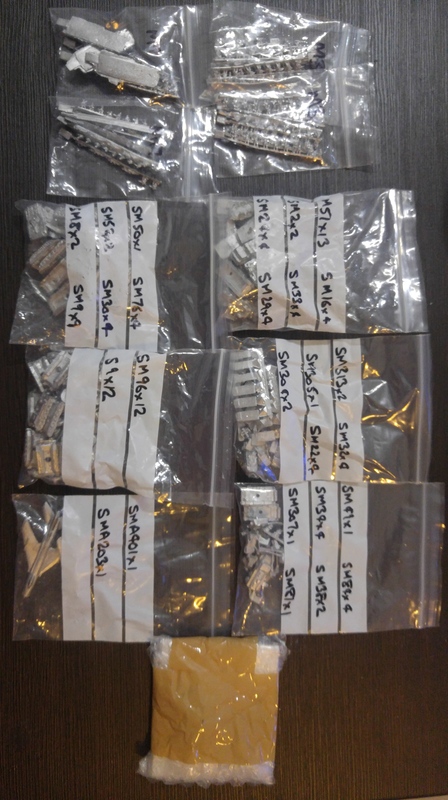 A few days later (well, 8 to be exact) a nice parcel arrives from England, label a little smudged as it was caught in a Singapore downpour. Taking it from the letterbox and rushing upstairs – rushing as much as the lift to the 17th floor will permit, I examine the contents. 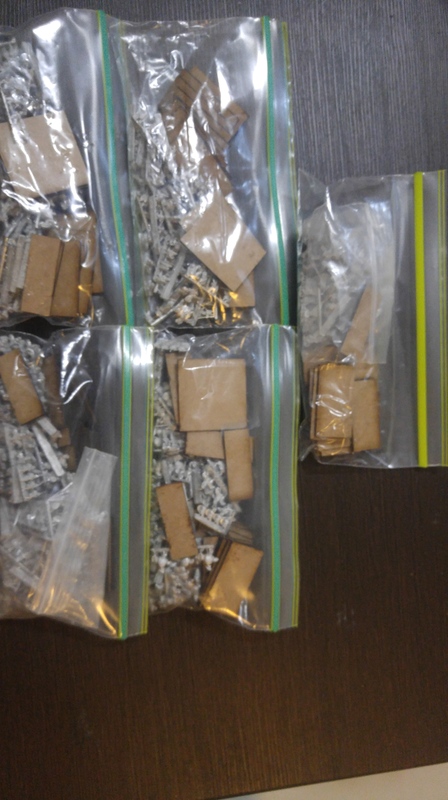 Yep, there are the 15mm Khmer from Irregular Miniatures along with a pile of 2mm terrain. You look at everything and imagine how it will appear painted. 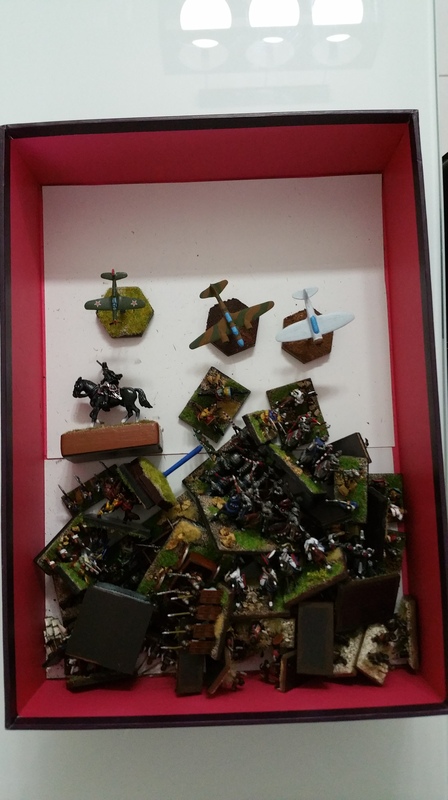 An hour or so is spent sticking magnetic tape to the bottom of MDF bases then cleaning the Khmer figures and attaching them to those MDF. It’s only when you complete that task that you notice that you have 13 elements and you are supposed to have 14! Oh well, on to the Interwebs and order four more Khmer archers. I known where I slipped up. I think I was going to use the three guys with the axe as either 3Bd or 3Ax in the army and use the figures I used for the 3Ax as the 2Ps because I have one of those left over. On checking up it seems that the Khmer Psiloi where likely crossbowmen so they ended up being pressed into service as the 2Ps. 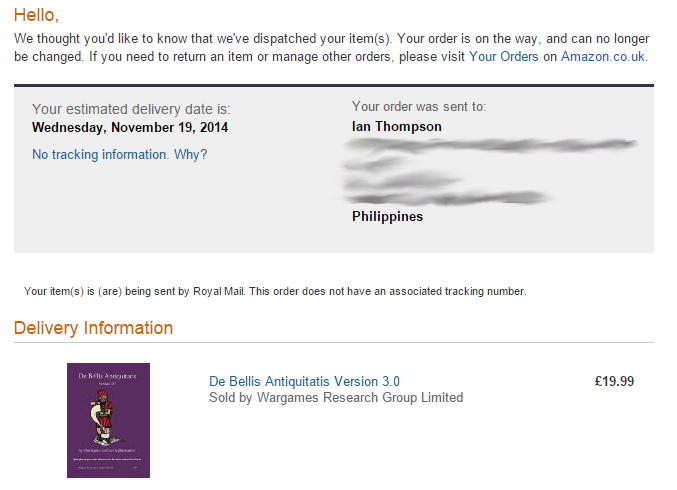 Now, you can’t just order four archers, the postage will kill you (as well the embarrassment). What else is needed. Well, the Burmese were an enemy of the Khmer and Irregular does do Burmese. Right, there’s the solution. 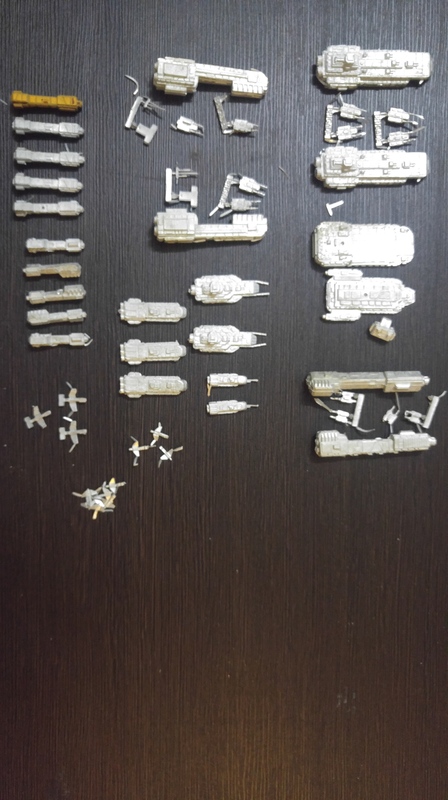 Order another DBA army from Irregular when you were just planning on doing the one army from them to start with. 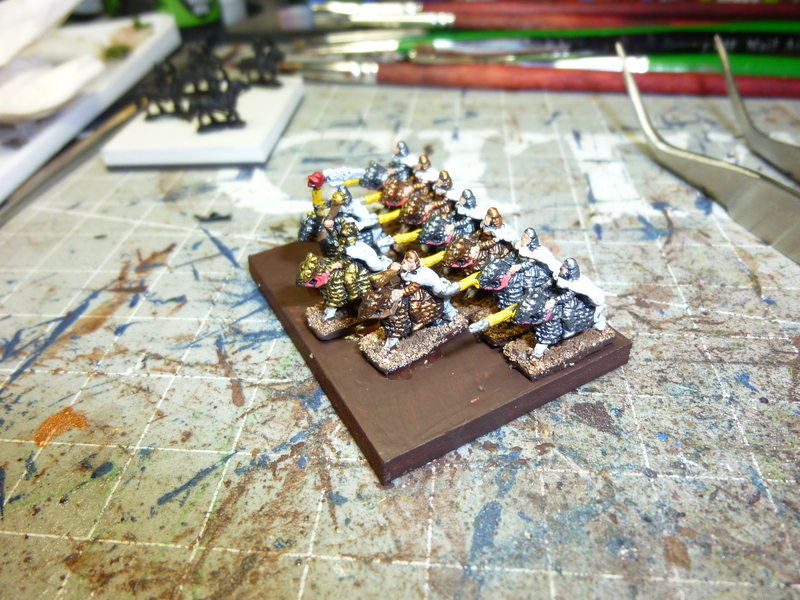 I remembered last night, I needed a camp for my DBA army for CanCon 2013. A quick rummage around and I came across a piece of castle wall that I was going to use for another project. 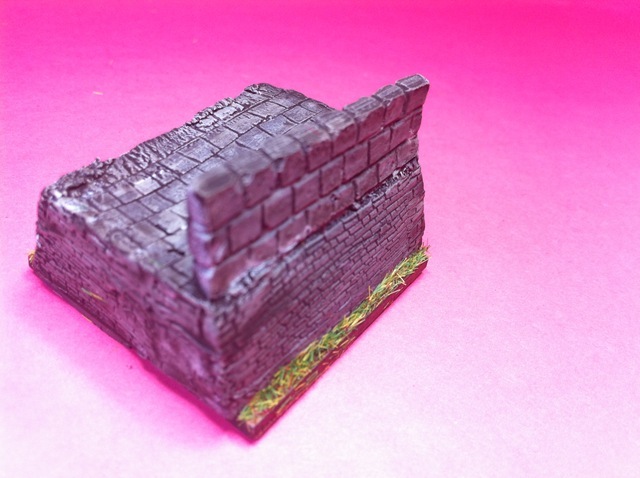 The wall came from Irregular Miniatures and was part of an early Christmas present for myself (there was also some 2mm scale terrain but that will need to wait for a future post). 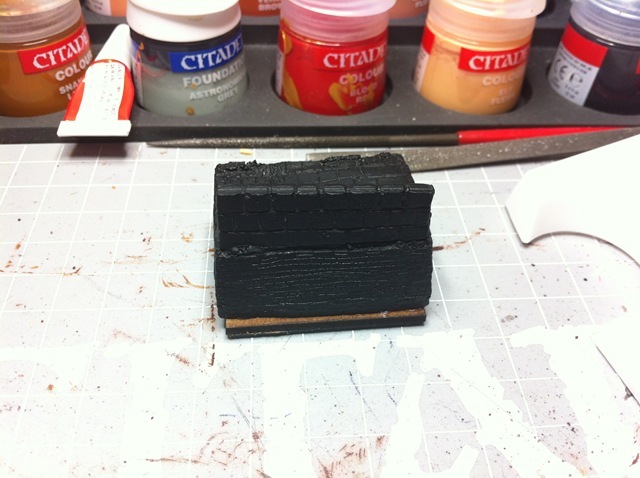 Measured the piece and it is about 3mm wider than 40mm so I figured I would just use a 40mm x 40mm base that I had. 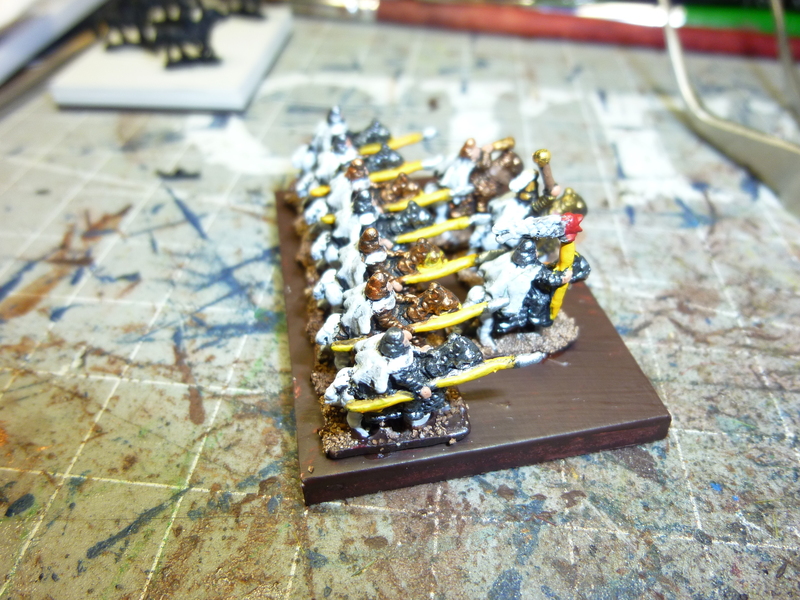 Based it, undercoated it in black, painted the rest of the infantry I needed to paint for the Later Hungarians, then a quick base coat, followed by a top coat and then a wash in black ink and we are almost done.